Brave and Happy: Must innovators be fearless? I was listening to Warren Berger's book on the way to school this morning. A More Beautiful Question. It was the last chapter and he quoted somesuch guy who said, "Innovators must be fearless." I immediately wondered if it was possible to be fearless in the face of uncertainty??? Can you try something completely new, different, and perhaps unproven without fear? Can you fearlessly move forward with something that could potentially be amazing...or could potentially be the opposite of amazing? Being fearless almost seems a little crazy to me. In order to innovate, I think it is much more important to be courageous! When you are ready to forge your way down a new path, strength and courage in the face of uncertainty will be more helpful than a lack of fear! Bravery is not the lack of fear. 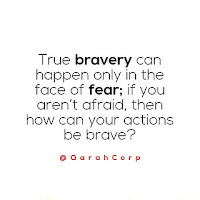 Bravery is your ability to persevere in the face of fear! 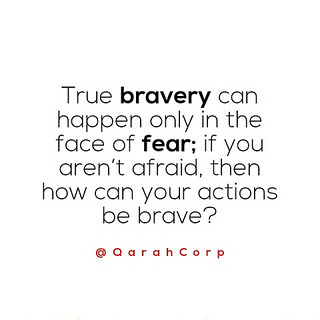 Be brave!